Reversing Extinction – What could the plan to resurrect the Woolly Mammoth mean for the Arctic ecosystem? In recent years, many scientists have heralded the return of one of the most iconic species of megafauna in natural history: the mighty woolly mammoth. Although seemingly a claim made by fans of Michael Crichton, the ongoing research by scientists has been described as both the pinnacle of scientific advancements and a way for humankind to ‘play god’ by reversing the extinction of species. Undoubtedly, this has interesting implications for civilisation and for science, as it could fill the gaps in the balance of an ecosystem that was caused by anthropogenic forces. But there are other implications this may have on our relationship with science and nature itself. Many are questioning the ethics of bringing back an extinct species, as well as why to choose the woolly mammoth. 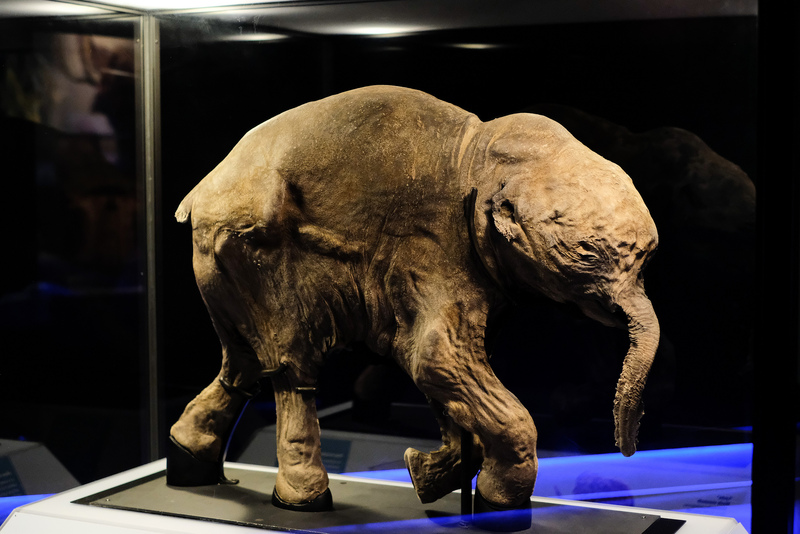 One such question that we need to ask as well is, should the woolly mammoth be resurrected, and what would the implications be for the Arctic region – its shrinking and once frigid home? The woolly mammoth, as we know it, refers to the last of the mammuthus genus, a branch of the elephant family that lived from the Early Pliocene to the Holocene, inhabiting most of North America and Eurasia. It is also one of a few select megafauna that coexisted with early humans, which they hunted as a source of food, as well as for bones and tusks for tools, shelter and art. Though it may seem like a long time ago, it coincided with the ancestor of the domestic cattle that we breed today: the aurochs. 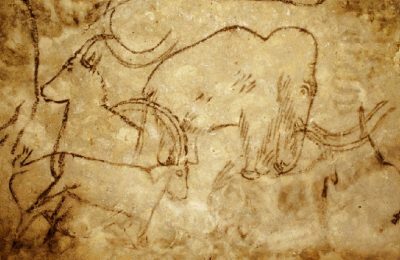 Left to right: Paleolithic painting of mammoth and ibex in the Grotte de Rouffignac; Upper Paleolithic lion-headed figurine Löwenmensch found in the Hohlenstein-Stadel and made entirely of woolly mammoth ivory. The species is most famous as being one of the most iconic creatures that evolved to survive during the Pleistocene era, which featured the end of the most recent glacial periods in earth’s history. This glacial period covered most of northern Eurasia and the North American landmass, creating a significant surface area for them to inhabit and led to several well-established populations up until the change in climate and the reduction in viable habitat (Baryshnikov, et al., 1999). The creatures remain today as potentially one of the largest terrestrial mammals to exist, estimated at weighing up to approximately 6 tonnes and at a height of almost 3.4 metres (approximately as much as an African Elephant). Following examination of the DNA of preserved specimens, most notably Lyuba, the baby mammoth discovered by a herdsman in 2007, scientists uncovered that the closest relative to the giant today is the Asian Elephant (BBC, 2018). This has offered scientists the hope of creating a hybrid as close to an authentic mammoth as possible. It has also helped to solidify claims that the mammoth adapted as far as having cryo-protective qualities in its blood, as well as other previous scientific uncertainties. There are several theories being researched as to why the woolly mammoth went extinct. Though involved in the Quaternary extinction event – the extinction event that featured the loss of megafauna and thus a collapse in faunal diversity and density – it is unclear whether it was as a result of overhunting by the growing population of early humans, the forces of climate change, or a medley of the two. Most evidence seems to point towards the climate argument, since the last recorded population appears to have survived on Wrangel Island up until about 4,000 years ago – well into the Holocene and the rise of humankind. However, there is still evidence that early humans had a role in worsening the already dire situation for the species (Nogues-Bravo, et al., 2008). Early humans, of course, may not have grasped the notion of a dwindling population or ecosystem management; thus, there would have been no measures installed to ensure their survival – they were being driven by pure instinct to gather resources by any means necessary to ensure their own survival. Thus, if humans did have a role to play in the extinction of the iconic ice age giant, this would play into the guilt theory behind the drive to resurrect lost species. This situation we are thus discussing is what could be called the Lazarus effect – as in the biblical tale of the resurrection of Lazarus. Many questions need to be addressed in the process of resurrecting the old species – is it ethical? Is it really possible? Even, ironically, what could go wrong? Firstly, we must address the ethics of resurrection. The process of de-extinction seemingly contradicts one of the most fundamental parts of environmental ethics – the notion of whether or not it will count as ‘nature’. With the idea that nature is based on pure wildness – in essence, separate from human activity, the resurrection of a species is inherently unethical as it contradicts the laws of nature. Further within this rhetoric, we even have the basic Darwinian principle of natural selection, indicating that perhaps within the laws of nature it was pre-destined that the mammoth would reach extinction. De-extinction is based around the premise of science being used to resurrect long-gone species. Despite this, however, some scientists argue that the remit of nature is irrelevant, arguing that human activity can, at times, be purely for bio-centric goals (Cohen, 2014). Additionally, some argue that resurrection of extinct species is fuel on the ‘guilt’ of humanity, as the cause of most extinctions is anthropogenic and, thus, the endeavour becomes positive in nature. The ethics surrounding de-extinction is complex, and potentially balanced on either sides, and perhaps the earliest point we can tell is once we actually hear the stomping of baby mammoths and see the results of the work. Despite news corporations heralding the return of the hairy pachyderm within a matter of years, many opponents argue that the possibility is far away. De-extinction is rooted in basic biology, and the manipulation of it. The current project focuses on the changing of Asian Elephant cells by adding mammoth DNA, which is a long and technical process. It is after the adding of all the required elements that the cells can then be coaxed into becoming an embryo (Pilcher, 2017). Currently, it appears that the team working on the project – headed by renowned geneticist Dr George Church – have succeeded in making 45 genome changes. Yet, science has indicated that the mammoth’s nearest relative has 1,642 genes separate from its woolly cousin, indicating that there is potentially a lot more work to do. Furthermore, the process is not focused on resurrecting a perfect woolly mammoth, as de-extinction science is not resurrection per se – it is the modification of a current relative of the species’ cells in order to get as close to a lost ancestor as possible, particularly with focus on some of the most important genetic traits of the woolly giant such as resistance to the harsh, colder climate (Campbell, et al., 2009). So, is the process actually about resurrecting the woolly mammoth? Or is it about attempting to bring back a species that can closely mimic the roles it held in the ecosystem? If anything, the notion of resurrection is a misnomer and the current endeavour is to fill the vacancy left in the biodiversity of the lower Arctic with a species as close to the woolly mammoth as possible. Alongside the arguments for and against its revival, the return of the woolly mammoth brings with it several theoretical risks and benefits. Firstly, it is almost impossible to predict how the resurrected species will behave and function in an unfamiliar ecosystem. A woolly mammoth today would not necessarily have the same sources of food available as it did back in the Pliocene and Holocene. Additionally, the first one revived would not be raised the same as its long deceased ancestors; with it possibly needing to be raised by its surrogate Asian elephant mother or by a human, which will not necessarily allow for it to develop the same behaviour and survival instincts. Another such risk is how the resurrected species will be able to cope against parasites and other bacteria that either were an important variable for the species’ survival when it existed, or how existing bacteria may have evolved beyond the immune system of the mammoth. Given the volatile nature of illnesses and the capacity for microorganisms to adapt and evolve quite rapidly, the reintroduction of a lost species could have a disastrous impact on the ecosystem and its biodiversity. However, it is also possible, on the other hand, that the genetic combination of woolly mammoth genes and that of the modern Asian elephant may be able to reduce this risk. However, one must also realise that resurrecting the species may also have significant benefits, particularly the resumption of the role the species once had in the ecosystem balance (Andersen, 2017). The team currently spearheading the resurrection of the woolly mammoth have argued that the reintroduction of the species could have multiple benefits for the Arctic region in terms of biodiversity and the reversal of the forces of climate change. In an interview with Dr Church, he stressed that the woolly mammoth could offer a vital way to preserve and restore the Arctic ecosystem. Grasslands act as carbon sinks as effectively as forests, potentially even more efficiently. This could be vital in the Arctic not just for trying to mitigate the forces of climate change that we are currently facing, but also the threat of exacerbation posed by melting tundra and permafrost that are releasing thousands of Gigatons of methane that has been trapped for thousands of years. Dr Church also stated that despite this being a difficult project at first glance, the results could arrive very quickly. In the Arctic Circle, the tundra is particularly at risk. The tundra is characterised by large expanses where the cold temperatures restrict tree growth and instead supports grasses and other hardy species like moss and lichen. Because of the temperatures, much of the soil is frozen, which traps the carbon store for long periods of time. However, in the face of climate change, this has become a risk with the melting permafrost releasing significant amounts of carbon and greenhouse gasses that have built over time, effectively transforming the region from a carbon sink to a carbon source. As such, the current geographical landscape is not only being affected by anthropogenic climate change but is also feeding into it (Kolchugina & Vinson, 1993). The melting of permafrost in Siberia at the moment is releasing vast amounts of stored greenhouse gases, estimated to be the equivalent of burning the world’s forests 2 ½ times. Despite the fact that permafrost is melting, and the decomposition of flora is a natural process in the global climate and carbon system, the impacts of climate change are exacerbating the problem resulting in emissions far greater than what is being sequestered in the carbon sinks (Christensen, 2016). This is where the woolly mammoth comes in. The reintroduction of the key species could return the region to a vast grassland and create an important carbon store that could help sequester the vast amounts of atmospheric CO2 and other GHGs, following the ecosystem service that the balance between natural forces and this species provide. If the ecosystem was able to be rebalanced and sustained, it could be a significant way to help reduce and mitigate the forces of anthropogenic climate change that it currently faces. One such plan currently being theorised is the Pleistocene Park, an initiative that seeks to restore the currently unproductive and jeopardised ecosystem back to the mammoth steppe ecosystem in Yakutia, Russia, which features a higher rate of biocycling and carbon sequestration (Zimov, 2005). The clearing of shrubs and trees, which has already commenced with the reintroduction of former biodiversity, would not only enlarge and enhance the existing carbon store but it will also potentially help introduce a more consistent climate to protect the ecosystem and prevent further emissions by the melting permafrost. Though the plan has already commenced with other herbivores such as bison and horses, the mammoth has the size required to promote the growth of grassland and enhance the biocycling of the ecosystem. Some may say it is an unusual topic, but the resurrection of the woolly mammoth could have grand implications for the Arctic. In the face of the melting Arctic, multiple efforts need to be attempted in order to ensure its preservation for both global biodiversity and for the global climate, especially when the current focus is on the Arctic ice sheet at the highest latitudes rather than the terrestrial ecosystems that also play an important role in its conservation. The team leading the charge has not released any papers for peer review yet, so the opposition and scrutiny is understandable. Yet, despite its opponents, the resurrection of the woolly mammoth could be very beneficial for the Arctic and the reversal of some of the severest mistakes our species has made in the ‘Anthropocene’. As developments emerge further, it will be interesting to see how the plan proceeds and whether or not the Arctic ecosystem will be on its way to being restored and conserved. The author would like to thank Dr George Church for his time to discuss his project to revive the woolly mammoth. Baryshnikov, G., Haynes, G. & Klimowicz, J., 1999. Mammoths and the mammoth fauna:. DEINSEA, Volume 6, pp. 3-8. Campbell, K. L. et al., 2009. Substitutions in woolly mammoth hemoglobin confer biochemical properties adaptive for cold tolerance. Nature Genetics, 42(6), pp. 536-540. Christensen, T., 2016. Permafrost: It’s a Gas. Nature Geoscience, Volume 9, pp. 647-648. Cohen, S., 2014. The Ethics of De-Extinction. NanoEthics, 8(2), pp. 165-178. Kolchugina, T. & Vinson, T., 1993. Climate warming and the carbon cycle in the permafrost zone of the former Soviet Union. Permafrost and Periglacial Processes, 4(2), pp. 149-163. Milner, R., 2012. Charles R Knight: The Artist Who Saw Through Time. New York: Abrams. Nogues-Bravo, D. et al., 2008. Climate Change, Humans, and the Extinction of the Woolly Mammoth. PLoS Biol, 6(4), p. e79. Zimov, S., 2005. Pleistocene Park: Return of the Mammoth’s Ecosystem. Science, 308(5723), pp. 796-798. Micheil Page is a Fellow at Polar Research and Policy Initiative. He is currently reading an MSc in Global Energy and Climate Policy at SOAS, University of London, specialising in Arctic governance and policy. He also holds a BA in Development Studies and Geography, also from SOAS, where his focus was on sustainable development. During his time at SOAS, Micheil has been actively engaged in multiple environmental projects. He is Co-Director of UniSolar, the UK’s first student-led community energy enterprise, which in 2016 successfully crowdfunded for the installation of solar panels on the roof of SOAS and now focuses on expanding into projects at other universities across the UK. Micheil also served as the Student Union’s Environment Officer, where he focused on promoting awareness of various environmental issues and reducing the use of single-use plastic water bottles across the university. Micheil also works in the Energy and Climate Division of Agora. His interests and publications have focused on the various intricacies of British environmental policy, from coal to sustainable ocean management.